Borrowing from its MB-08 cousin (or vice versa), the L96’s folding stock and cheek plate are welcome additions to a rich feature set. Also included is a sturdy monopod – just make sure the included screw is securely tightened. The L96 is meant for a plethora of shooting environments and has color choices to match. WELL offers its L96 in Black, Tan, and OD Green. These colors and patterns accompany a solid polymer stock. This is nice and hefty but can be too heavy for some. Keeping with the authentic L96 design, WELL’s offering includes a fluted barrel and muzzle break. This aggressive styling adds to an already intimidating appearance. 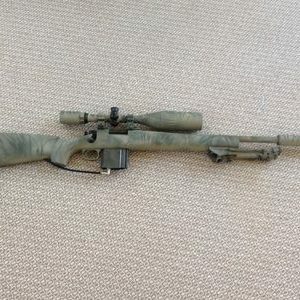 This rifle absolutely looks the part and will draw compliments. Most top rail systems for sniper rifles support Weaver-compatible optics. The L96 boasts both Weaver and Picatinny compatibility, opening the door for a greater range of scopes and attachments. The feeding clip is made out of plastic and sometimes has a tendency to loosen or break. In some instances, owners can run into feeding issues. Out of the box, the L96 hits hard and shoots straight. Without upgrades the gun has pretty exceptional range, reliably hitting targets up 150 feet away. Though the gun can be upgraded fairly easily, most owners will not need to invest to see great results. However, that option is still there, especially since the rifle fires well with high-powered springs. Paired with a high-quality scope, the L96 can cover extended ranges with heavier BBs. The hop up system is the star of the show for the rifle. Using Tokyo Marui’s famed system, shooters can quickly and accurately dial in their guns in the field. Though the bolt can be harder to operate initially, the assembly is made from metal. This will deliver shot after accurate shot without huge fluctuations in performance. 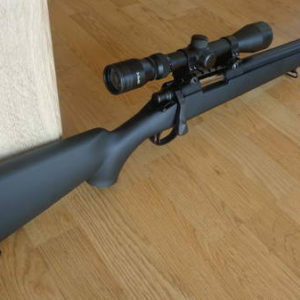 The WELL L96 is often measured against the Bar-10 and MB-01, and offers comparable performance to those platforms.